The ancient Vedic science of Vastu, is the sacred science of space, spacial relationships and building. It is actually the origin of the popular Chinese system of Feng Shui. Correct Vastu is based on an orientation of all buildings in an appropriate alignment with the primary and secondary directions. The most favorable energies come from the East and the North. The auspicious East direction where the Sun rises each day delivers the solar, masculine, electric, yang, healing and inspirational energies. The Earth’s magnetic flow proceeds from North to South. The benevolent North direction brings the lunar, feminine, magnetic, yin, nurturing and nourishing energies. Ideally, the front door of your home or office should directly and squarely face either of these directions, East being preferable and North also being very favorable. When you choose a plot of land or a lot on which to build your home or commercial building, ideally the four sides of that plot should squarely face the primary directions — North, South, East and West. The property itself should have a square or a rectangular shape as these shapes afford stability, solidity, consistency, strength and longevity, having four strong sides and four complete corners. 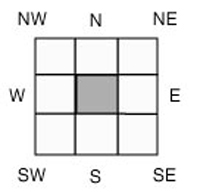 The corners of your plot should face the secondary directions, viz., Northeast, Southeast, Southwest and Northwest. Circular plots or building shapes are not recommended since they can create a nomadic type of lifestyle as seen historically with the teepees of many American Indian tribes and also with the yurts erected by Mongolian tribes. They do not offer prolonged stability as do squares and rectangular shapes. Triangular buildings and plots should also be avoided since they obstruct progress in life and can cause problems with the government as well as prolonged legal conflicts. If your plot is not aligned to the primary directions, then you should at least try to orient the walls of your house or commercial building to these directions if you decide to build on such a property. Since the North and East are the most favorable of all the directions, it follows that the Northeast is the most auspicious sector of the house, since it consists of a combination of these two energies. This is the direction from which the divine, godly, spiritual, intellectual, intuitive and knowledgeable energies enter the home or office. It must be kept open, light, clear and spacious on the plot itself as well as in the house, and even in each and every individual room, if possible. What applies to the macrocosm, applies to the microcosm. This is an excellent place for meditation, thinking and creating. Another very important principle in Vastu is the central space of any plot or building. It should always be kept open and free. This space is called the Brahma-sthan, literally, the ‘place of God.’ This place is always located right in the center of any building. You will notice that almost all older, governmental and classical buildings have an open central area, many with a skylight or a central courtyard. This can be found in countries and civilizations throughout the world. In our illustration below, the building or the plot is called the mandala. The mandala should be divided into nine equal units. This can be measured out on a copy of the building plan. Now you have the nine quadrants of your mandala. Each quadrant has particular and specific energies related to living and working. The centerpiece (red in color) is the Brahma-sthan, This must always be kept open, free and uncluttered on each floor of the building as well as on the plot itself. Establishing a Brahma-sthan brings peace, balance, health and spiritual growth. The North is favorable as a main entrance, office or study, or a place to keep wealth, jewels, cash and valuables. The Northwest is good for a living room, guest bedroom, study, garage, vehicles, pets and animals. The West is suitable for the dining room, living room, children’s room, den or study. The Southwest is functional for storage, heavy or large objects, or the master bedroom. The South is useful for a dining room, a bedroom or a staircase. The Southeast is ideal for the kitchen, central heating and electrical equipment, or the computer room. The East is beneficial for the entrance and reception area, a family room, or dining room. The Northeast is suitable for a mediation room, a sun porch or deck, or young children’s bedroom. Bathrooms should never be placed in the Northeast since it can result in significant health problems for the inhabitants. When you are living in a house or working in an office with Vastu defects, the defects can be reduced or neutralized in various ways. The use of yantras or spiritual geometrical diagrams is very effective in stabilizing unstable or negative Vastu energies due to incorrect alignment of the building or poor placement of rooms, bathrooms or objects. In this second article about Vastu, we will show you how to utilize the spatial energies in your home or place of business in the most effective manner. The ancient Vedic science of Vastu, is the sacred science of space, spacial relationships and building. It is actually the origin of the popular Chinese system of Feng Shui. Correct Vastu is based on an orientation of all buildings in an appropriate alignment with the primary and secondary directions. First, make a drawing of the floor plan of your home or business. Or make a copy of the existing plans. Since most buildings are rectangles, draw the mandala or energetic field of the building along the outer walls. It should be a rectangle or a square (the most stable geometric shapes for buildings). If your building is an L shape, for example, then you will have an entire section (the bottom of the L) outside of the main mandala. Now divide your mandala into three equal parts along the length and width of the building and draw vertical and horizontal lines across the mandala. Now you should have nine spaces of the same size. If your house is a rectangle, then these nine spaces will be rectangular in shape. If your building is a square, then these nine spaces will be square in shape (see diagram). Now, using a compass, accurately determine the directions which the walls of your house face and write those directions onto your mandala (see diagram). On the diagram below, the first line states the direction. The second line gives the planet which rules that quadrant. 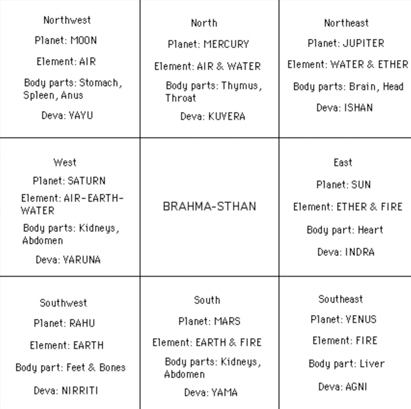 This is helpful if you know something about the planets and their nature. The third line reveals the elements ascribed to those quadrants. Note that there are five main elements in creation and therefore in Vastu, and they are defined predominantly by the secondary directions. Northwest is Air. Southwest is Earth. Southeast is Fire. Northeast is Water (and Ether to a lesser extent). Southwest is Earth. And the Brahma-Sthan in the very center of the building is Ether or Space since it is the seat of God or the most sacred place in the structure where only God or that which represents divine energy can reside safely. You will notice that the four main directions carry a combination of the elements on either side of them. The North takes air from the Northwest and water from the Northeast. The East takes ether from the Northeast and fire from the Southeast. The South takes fire from the Southeast and earth from the Southwest. The West takes earth from the Southwest and air from the Northwest. It also carries the energy of water. Why? Because the god of the seas, Varuna, rules the Western direction. The next line reveals the Body Parts represented by these directions. And the last line explains the Devas or celestial beings who rule these various directions. Since this article is not meant to be an exhaustive explanation of how Vastu works but merely an introduction, we will endeavor only to give some examples so you will know how to use this highly effective mandala for your home or office. Let us begin with the elements. Suppose you want to place a swimming pool, hot tub or water fountain, indoors or outdoors. You will note that the Water element is predominantly situated in the Northeast. However, it is also situated in the North and in the West. So these are the places or quadrants where your pool, hot tub or fountain should be located. Suppose you want to build a kitchen or fireplace in your home. The best quadrant for this is the Southeast where the element of Fire is predominantly located. Secondarily, you could locate them in the East or the South. Since Air represents activity, the Northwest quadrant of your home or plot would be ideally used as a living room, play room, guest room, garage, or menagerie. The West area would serve well as a dining room, children's room, study or den since the West reflects three different elements. Storage, as well as large and heavy objects correspond to the Earth element and are best placed in the Southwest. The grounding effect of the Earth element makes the southwest ideal for the master bedroom. Plenty of light and large windows are needed in the East to welcome the rays of the rising sun. Here you can happily place a sun room, living room, dining room, etc. Meditation and prayer is best done in the Northeast where the subtlety of Ether and the amplification properties of Water are strongest. The North quadrant is a good place for a staircase leading up or down or both. In the South, you can place a dining room or a workout room. Most people do not have an open central area (the Brahma Sthan) in their homes or offices. But this is a very important factor in the successful application of Vastu principles. No matter how small it may be in your home, it must be kept free, open and clear as far as possible since this is where the divine energies enter the house from above. When we have blockages, negative energies or wrongly utilized quadrants, it can lead to health problems, disease, loss of money, business struggles, relationship difficulties or other such reversals. In the mandala diagram, you will see that certain body parts are assigned to the directions. If a particular quadrant is blocked or negatively impaired, we could have health problems with the body parts indicated. For example, if you are having problems with your feet or ankles, then you may want to see what may be causing a blockage in the Southwest of your house. Toilets must never be placed in the Northeast or the Southwest because the sewage water can cause detrimental energy contamination. Placing toilets in the Northeast, in particular, can lead to various cancers. In our next article on Vastu, we will look at the Devas or celestial beings in charge of each of the directions and what role they play in bringing balance into your home, your office, and your life. In this third article about Vastu, we will show you how to utilize the spatial energies in your home or place of business in the most effective manner. We will look at the Devas or celestial beings in charge of each of the directions and what role they play in bringing balance into your home, your office, and your life. The ancient Vedic science of Vastu, is the sacred science of space, spacial relationships and building. It is actually the origin of the popular Chinese system of Feng Shui. Correct Vastu is based on an orientation of all buildings in an appropriate alignment with the primary and secondary directions. We refer to the same diagram we used last time round. Beginning in the North direction, we find it ruled by the deva known as Kuvera. Kuvera is the treasurer of the gods so his primary concern is the attraction, safe-keeping and expansion of wealth. This area must be kept open and welcoming, both inside and outside the building. This is an ideal direction for the front door to face. It is a good place to keep a safe and all valuables including money, gems, gold and documents. A picture of Kuvera can be kept here if you are so inclined. Moving clockwise which is the most favorable direction for movement, we come to the Northeast. The deva in charge of the Northeast direction is God Himself, known as Ishan, the supreme controller. Here is the direction from which the most spiritual and celestial energies enter the home. This is the place in which to set up your altar for making offerings of lights, candles, incense, food, flowers, fruits, personal service and love to God. This is also where meditation should take place and the practice of yoga and attunement with the divine energies. This is where you cultivate purity of heart and clear karma through remorse and forgiveness. The Northeast represents the future and how things will unfold for you. It is the place where human effort meets destiny, the two wheels on the chariot of human fulfillment. Here you can place a picture of Krishna, Vishnu, Shiva or whatever manifestation of God you serve and meditate upon. Next we come to the East direction which is considered to be highly auspicious since the Sun rises daily from this direction, no matter what hemisphere you may live in. The deva which rules this direction is Indra, known as the king of the gods. Here we find the prime direction for the front door of your building. This is a good place in which to do business, expand your career goals, study, and take positive action to make your mark in the world. This is the place in which to realize your own kingship or queenship and to make your impact for the benefit of the whole. This is where you call upon your courage so that you may effectively utilize your power and potential. You can place a picture of Indra here if you like. The next direction is the Southeast, the abode of Agni, the deva ruling fire. Fire can be a highly creative or destructive element. Creativity and conceptualization develop well here. Also, the realization of goals and objectives can be met in this direction. What cannot be entertained here are anger, frustration, resentment, criticism, blame and guilt. Because these will flare up like a volcano if allowed to run amok in the Southeast. And they will rapidly burn out of control. And so, with a cool head, nurture your creative fire here and feed thousands, rather than burn down the house and destroy what you have built. If you are inclined to perform sacred fire ceremonies, then they should be done here. You can place a burning candle here and a picture of Agni, the fire god, if you wish. Moving down to the South, we come to the abode of Yama, the deva ruling autumn, decay, transitions, conclusions, resolutions and death. This is where you put an end to things, be they personal or business relationships, or various undertakings. Yama is also in charge of dharma or proper conduct and the realization of obligations. Here we ponder our duty and carry out our responsibilities. Here also, we mete out proper punishment and correction when necessary. This is the place of justice. The dead can also be helped from the South. Here we leave behind all that which has come to an end. A picture of Yama can be placed in this area if you choose. Traveling to the Southwest, we enter the abode of greatest shadow and darkness. For this is the place of Nirriti, the goddess of darkness, destruction and shadow. It is also known as the place of Rahu (see above article). This direction embodies old, entrenched karma, unresolved issues, generational patterns, old family behaviors and expectations, addictions, obsessions and compulsions, depression, etc. It represents the past and the hold it may still have on us as we move forward into the future of our unfoldment. It is also the entry point or portal to the other dimension for a house that is haunted by ghosts, spirits or human souls who are stuck and unable to move on. When energies in a house or business become very dense, destructive and immovable, then this is the direction that demands our greatest attention. This is where deep clearing and cleansing can have the most benefit. With the intention of offering honor and recognition, you can place a picture of Nirriti and/or Rahu here. As we move West, we enter the abode of Varuna, the god of the waters and the master of fate. And this is probably why he is so closely affiliated with Saturn, the planet of fate and destiny. Varuna is known as a magician and thus is a master of illusion. In the West, you can sink more deeply into illusion or free yourself from illusion. Varuna maintains the inner truth of the universe which can be seen more clearly in the darkness at night, when this world of illusion effectively disappears for a time. This is the place of knowledge. Varuna is the master of 100,000 remedies so healing can effectively take place in the West of your home as well as the East. Life extension and longevity occur under these energies. Any needs you have regarding water for drinking and bathing, etc, fall under the domain of Varuna. In the West, we can calm the waters of emotional conflict. Here we should place some symbol of water — an urn filled with water, a swimming pool or hot tub, an indoor or outdoor fountain, a picture of the ocean, a lake or river. And a picture of the god of the waters, Varuna. And finally, to the Northwest we find the deva of air, Vayu. Vayu rules life, health, activity and movement. This is the place of greatest movement, shift and change. That is why it is suitable for entertaining guests, such as a living room, a guest bedroom or activity room or den. Outdoors, we place the play area and/or the garage or driveway where vehicles come and go. This is where you come to breathe and catch your breath. If someone is having respiratory problems in the home or at work, there may be a blockage in the Northwest that needs to be cleared. Air and wind is known to be the great purifier of all spaces and places. Much power and strength can be harnessed in the Northwest direction. Since Vayu is known as the king of celestial musicians, this would be an ideal place to put your music or recording room. And a picture of Vayu would set it off nicely.